Welcome to the Stoney Creek Southern! 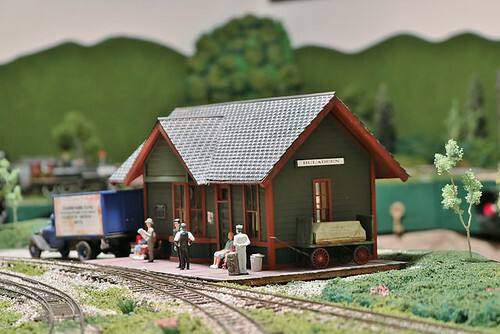 This page is dedicated to my ongoing On30 gauge model train layout. 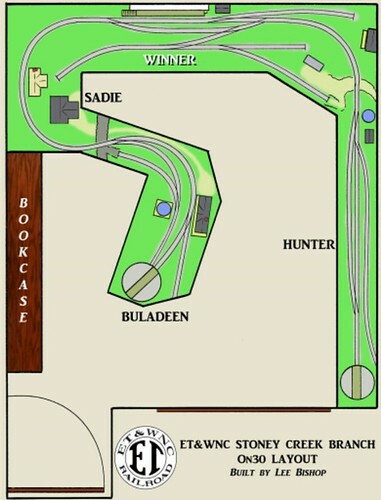 The layout is a representation of a fictional branch line of the East Tennessee & Western North Carolina RR, taking place in late summer of 1943. Keep checking here for news, as this page is often changed with the newest info and photos. 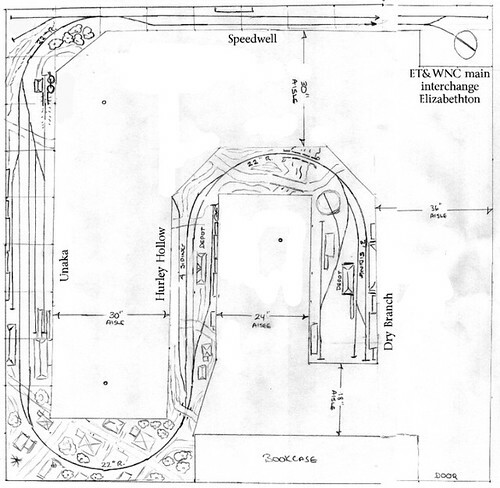 Larger format photos of the layout can be found at my Flickr photo set . They also did a DVD, and my layout is on the cover! 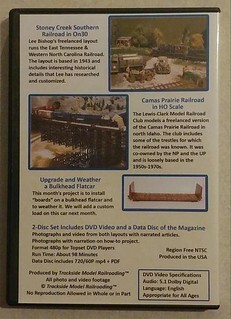 My work has been in seven model railroad publications since 2017, and more to come in 2018! This is Ross from the Trackside publication, getting stills and video on my layout on December 9, 2017. 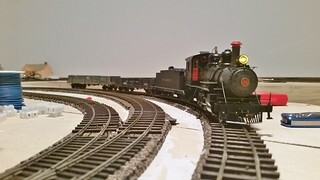 February/March 2019 O Gauge Model Railroading Magazine has a feature article on my layout. August/September 2018 O Gauge Model Railroading Magazine has a photo of my layout. 2018 On30 Annual has an article I wrote showing how to turn a used tender into a water car. March/April 2018 Narrow Gauge and Short Line Gazette did a article on the military/historical aspect of my layout. 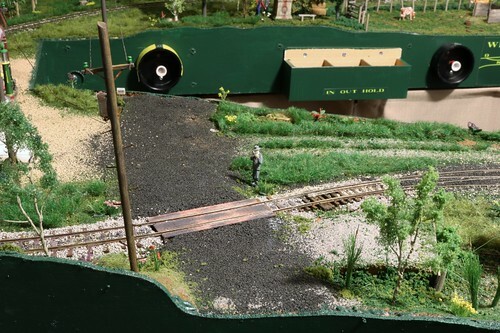 January 2018 Trackside Model Railroading online magazine did a excellent profile of my layout, with great photos. They also released a DVD of all the video they shot. 2017 On30 Annual did a feature article I wrote on the layout. 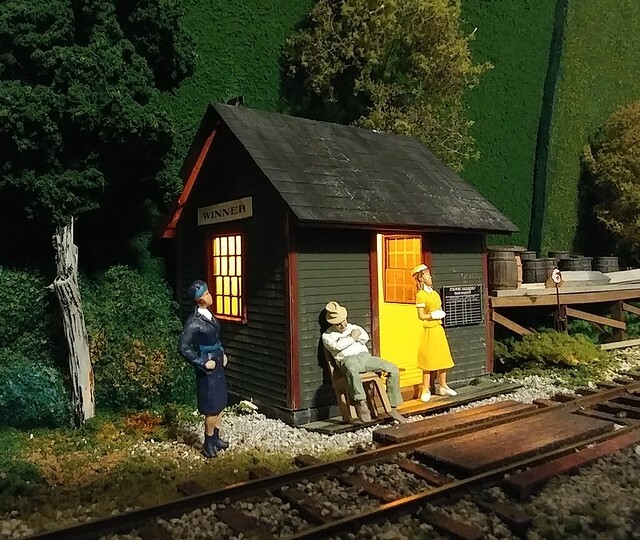 Model Railway Hobbyist ran two photos taken on the layout in 2017, in the March and December issues. While not model RR-related, I got a photo published in the December, 2017 issue of Fine Scale Modeler! It's of my Dad's amazing 1/6 scale Civil War James rifle field gun. Ironically, I was visiting my parents in Florida when I found out and was standing right next to my Dad when I got the news! 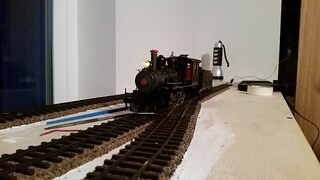 I was very stressed in the Spring of 2019 (let's face it, I am stressed from work often) and a lot of home improvement we'd done on the week before Eastern 2019 (had most of the interior repainted and the house re-roofed), so I haven't gotten to the layout much. 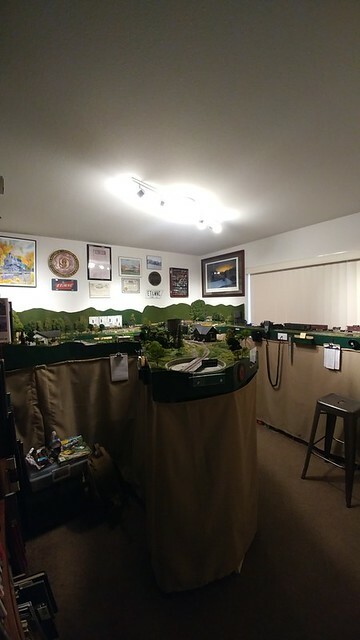 Still, on Easter Sunday evening, my wife and I added new lighting to the layout room, with a large LED and 4 'cans', 2 each on a rail sticking out from each side, pointed at various places on the layout. Though it's not as good as a full LED track over the entire layout, it's still a big improvement over the original single room light from when we had the house built! Oly Ops 2018 went really well on October 13th. I had one turnout sticking (thankfully one I could easily reach) but otherwise it worked out great for the two groups involved. the weather was perfect that weekend, as well. I decided to replace the heated/bent styrene covers for the locomotive tender lights with ones made of brass. The ET&WNC made sheet metal covers for the backup lights to keep them from being damaged by the dumping of the coal adjacent to the fragile lights. I'd used sheet plastic that was heat-formed over a rod, but the plastic was too thick and never looked right. So I bought some thin 1/2" wide brass strips and replaced them. It was a very quick and easy project that was well worth it. "Roads? Where we're going, we don't need roads..."
Adjacent to that, I had my "war of Northern Aggression" (Yankees know it as the Civil War) memorial that was between two spurs as I could never find a place that looked right for it. My article in the 2017 On30 Annual shows it in that odd location. Once the pasture came to be, I noticed a small copse of trees adjacent to that. It looked like a great spot. So, I moved it and I think it looks way better there. Keep in mind, East Tennessee was almost half pro-Union at the time. My Father made the barrel on a lathe for this, and is an accurate rendition of a M1857 12-pounder "Napoleon" barrel. 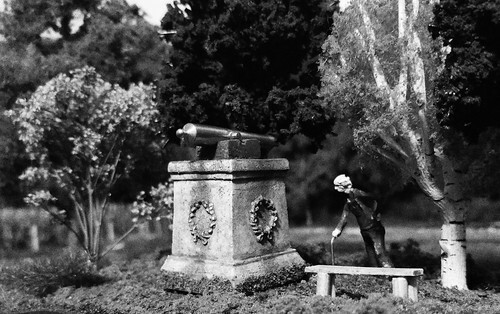 In the 1940s, this is the only type of Civil War memorial you'd likely find, other than a statue of a soldier. Battlefields didn't have replica cannon carriages on them until well after WW2 and an original carriage would have rotted away after 70 years. So a pedestal is historically accurate. My wife surprised me by making a set of curtains for the underside of the layout. I had no idea she was even thinking about this but they turned out perfect and they really add to the overall look of the room! I then added some cups in a couple of places and also used some of the extra hooks my wife had left over from the curtain project to put in place to hang the re-railers. I use Kato HO ones as they work great for On30 track. Most other HO ramp re-railers have 'wings' to the outsides of the rail and don't work well on On30 track at all. The cornfield on the Ensor farm was completed with over 400 plants in this little field, but planted tightly together as they would be in real life (but further apart than in the modern era of combines). I really like the way it looks. This makes for a good 'view block' to trains going around that sweeping curve behind the farm and store. It's the thing that visitors most comment on when they see the layout for the first time. I still can't believe I managed to find a train order sheet from the ET&WNC, but better still, it has locomotive # 12 listed on it, and is from the year and time of year my layout takes place! It's currently in a frame on the wall of the layout room. I have a notary embossing stamp from Carter County, TN from the 1920s, so each one will be marked with that. This sign is right above the door to the layout room, put in place a couple of weeks before the first op session. This is what you see if you open the door to the room far enough. 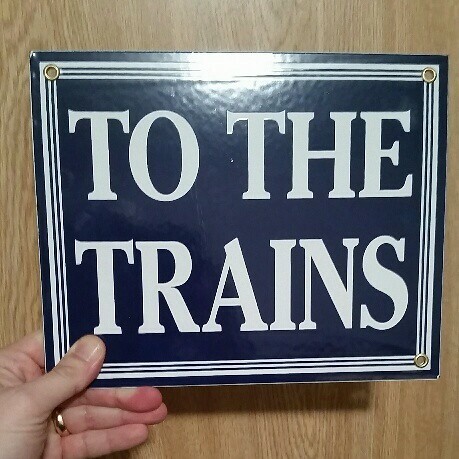 I made the sign myself and will be hanging framed first pages from articles on the layout (or covers, as in the case of the Trackside Model RR'ing article in the center). There'll be more to hang up as time goes on and I write more articles. Note the crew 'train order' blackboard in the background, right above the turntable at Hunter. 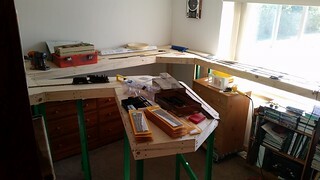 This photo shows the setting up of the benchwork in the layout room on August 9, 2014. 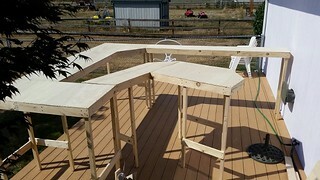 With a lot of help from my pal Robert Scott, the bench work was installed, bolted together, levelled, and track laying started before dinner time that same day. I was worried that my measurements were off and the thing would be too big to fit the room. I still have no idea how, but I was actually four inches short in the back corner, but better short than long. It worked out as it placed the center section a little further away from the book case, so I was fine with that (and added some to that edge later on). The hole for one turntable was cut out and the pit test fitted as well (it dropped right in, no changes were needed). 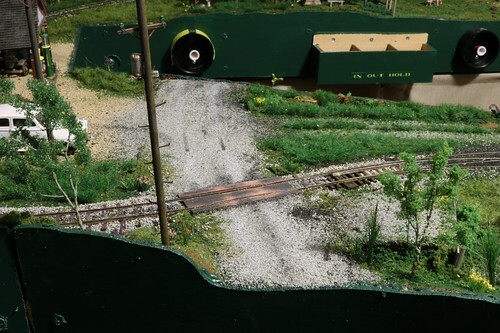 The area where the tool box is sitting is where the majority of the sidings and the one passing tack are now located (in the Winner section). The section in the center of the room became the end of the track. You can see one of the ten-wheelers to the left of the center of the photo. I almost couldn't handle standing in the center of it all, that first evening. I'd been dreaming of this for the better part of 30 years. 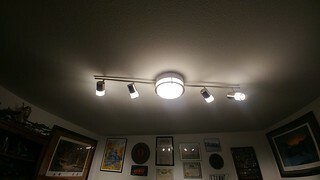 April 21, 2019: Added new overhead lighting with LEDs. So, why was the layout built in sections? 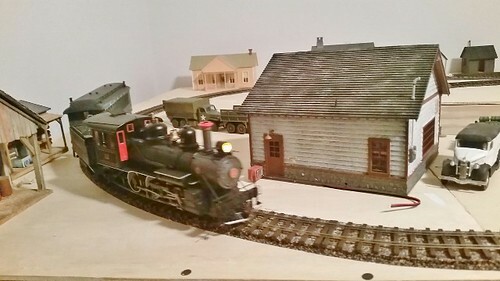 My layout is in a finished room with my collection of military and RR stuff. It's not an empty space you can haul lumber and saws into. It's also a relatively smaller room, about 10X11 feet. So, I built the layout in 4 sections. They were be bolted together between sections with two carriage bolts at each seam. Track was laid over top of that, and scenery placed over that as one large structure. Why, you may ask? This is just in case we ever have to move. All I'd have to do would be to cut through the scenery with a knife, snip the rails, yank out the bolts and unplug the wiring to take it out of the room. Even the legs are held into sockets with bolts. I built it as if it were a module display that never moves. I've seen too many heartbroken people having to destroy their layouts when they've moved. While I don't anticipate that happening (at least for 5-10 years the way things are going for my employer), I don't want to risk it. Sure, I could still destroy it if I wanna start over, but I'd rather have the option. It was built with 1X4 and thin plywood (the blue point switch machines were anchored with thicker wood under the points). Why couldn't the layout be bigger? It could have been larger, to be honest. My wife even agreed to an earlier plan of mine to get a shed constructed for the layout and placed on the 'back 40' of our property. The more I thought about that, the less of a good idea it seemed. I've known people with layouts that are out of the way of normal occupation of their homes, and the builds on these layouts always seemed to take forever. 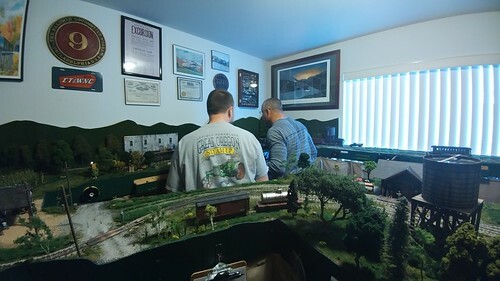 Even my friend Robert (who designed the initial track plan) has a HO layout in his garage which he admitted he rarely ever walked into the room. I didn't want that. I wanted the layout in a place that was comfortable, easy to get to and in a place I wanted to go. By sacrificing size, I think I now have a layout which is in a place where I went far more often than if it'd been in the garage or a shed out back. I can't imagine I'd be nearly this far into construction if the layout was tucked away from sight. So if it means it's way smaller than it could have been, I'm just fine with that. And besides this, if I ever had to move, I never could have picked up a large shed and had that moved as well, with the layout inside. I still need some hopper cars of the ET&WNC type. I haven't found a good way to model a bunch of them just yet. 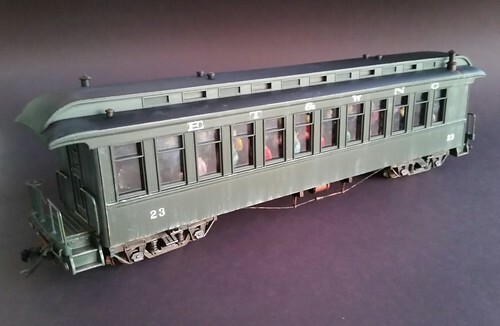 The short Bachmann passenger coaches are neat looking but they just don't look right for the ET&WNC's ones. With that in mind, I bought an AMS On30 coach. 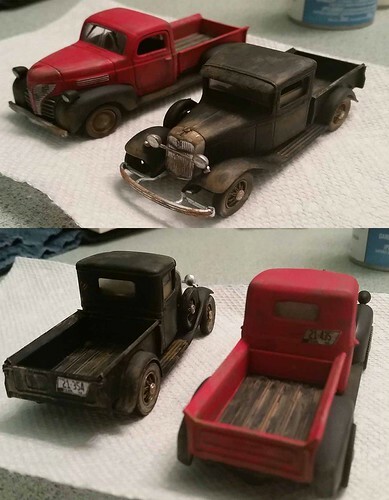 It was a nightmare taking one apart without any idea how to do so (you must de-solder the pickup wires to the trucks to take the body off), but I had to get in there to get the windows out for re-painting and to put passenger figures into the seats. Floquil Pullman Green was a very close match to the paint already on the car, so I just sanded down the markings and blasted the remainder of the coach with that after masking off portions of the roof. The decals took a while but worked out okay. Before assembly, I added a passenger to each of most of the seats. I didn't put the wiring back as I wasn't impressed with the lighting anyway (it flickered badly on the test runs on the layout before I took it apart). After having only one coach on the layout since I first started running trains, I decided to finally modify, paint and decal the other AMS coach I had into Linville River # 4. This coach was on the property as late as 1944, but I haven't determined if it was being used on trains as late as 1943. It's not a perfect representation of the coach as the AMS coaches have different window types, number and placement and other details, but I still like how it turned out. The only problem is that two of these AMS coaches won't make it through the S-curve heading into the Buladeen depot at the end of the line. The frames are simply too long to allow for the swing of the bodies of the coaches through those two turns. So, passenger trains must be limited to one coach when going past the Winner depot. 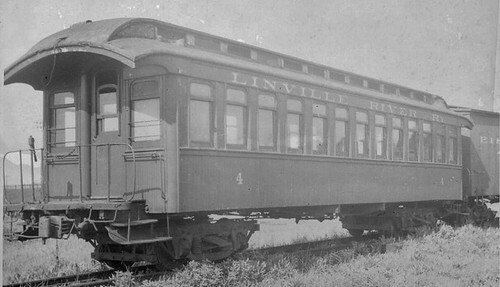 The second photo is a 1942 photo of the real #4, probably at the coach yard in Johnson City. 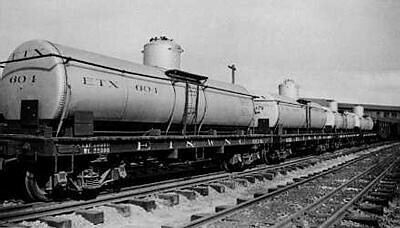 I have two tank cars, numbered 600 and 604. The ET&WNC only had two tanks on the property by 1943, and I have created reasonably accurate decals of the tank body markings for each. 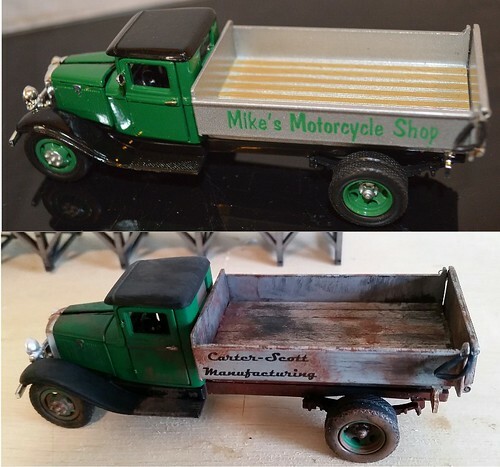 I like how this turned out, especially with the weathering, which used weathering powders for the rust. Of course, they're not perfect models of the original cars, but Bachmann's tank cars aren't that far off for the real ones, as seen above. Someday, I'll be replacing a lot of these cars I currently consider, "representational" of the real ones with far more accurate looking rolling stock. 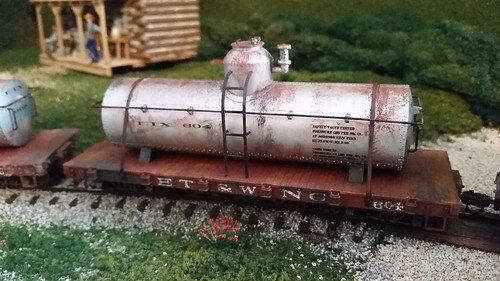 I finished caboose # 505 at the end of April 2015, from a kit by Deerfield River Laser. The real 505 had badly peeled paint in 1943, and I made it look like the road-worn hack it was at the time. Thankfully, the real 505 still exists, at the Avery County Museum in Newland, NC. To get an idea how much work went into the other freight cars, look at this photo. This is a split photo showing the exact same car. To the left is how it looked coming out of the box. 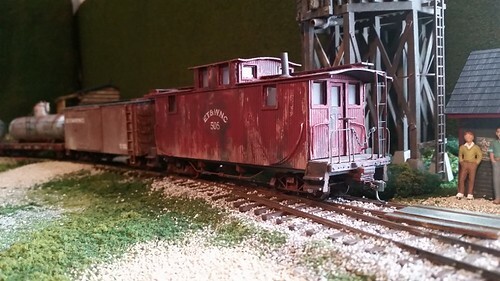 To the right is what I had after I was done re-creating a pre-war ET&WNC low gondola (most have the wartime-era sheet metal number plates on the center sides). All I really did was cut down the sides, add some decals and do a lot of paint work. 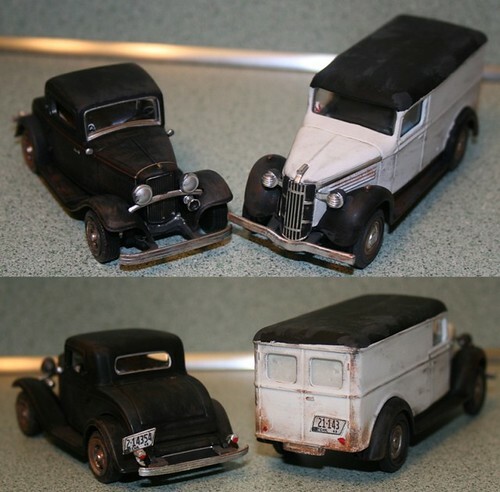 Though few of the gondolas have road names, I wanted a couple of Linville River marked cars for the heck of it. One thing you'll not be seeing are all the 'whimsical' stuff many other people into On30 have on their layouts. The primary reason I got into On30 was because Bachmann came out with affordable narrow gauge stuff and especially the ET&WNC 4-6-0s in factory paint. If it weren't for that, I probably never would have gotten back into model trains again. 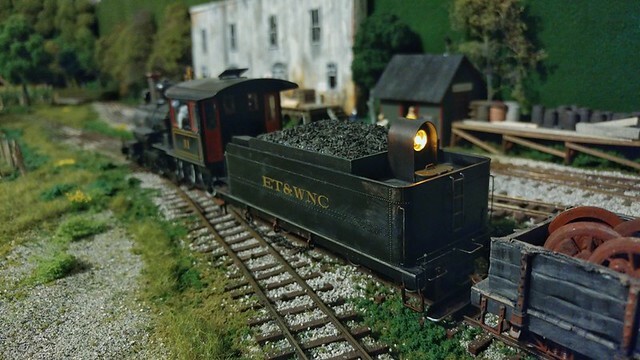 If anyone had come out with ET&WNC locomotives in On3 instead, that'd be the gauge of my layout right now. Any layout needs structures, and since I wanted to have everything done that could be done before the layout was actually built, I'd taken on some structure projects. I had some kits and scratch-built some stuff. One of my favorite structures is the Buladeen depot. 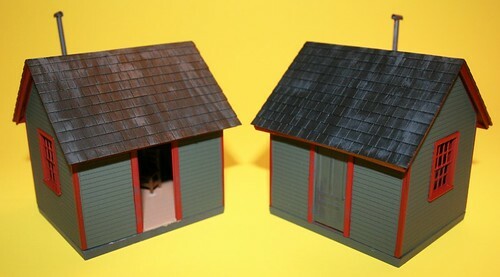 It's made of a mix of basswood, thick cardstock and plastic for the roof and door/window castings. I painted the trim color close to the ET&WNC red they trimmed their depots with prior to 1945. And the rest, I blasted with Floquil Pullman green. I then created a scale train bulletin chalkboard. If you take a magnifying glass, you can actually read the thing. I made three of these boards, for each of the three depot/flag stop structures. I then placed figures around each depot with a critical eye, judging what looked more correct. All figures on the layout are in 'static' poses as I can't stand figures frozen in action poses when the trains alone are moving. The two flag stops were Grandt Line kits. I decided to model one with the door closed and shades drawn, and the other with the door open and a reasonable interior with stove and wall hangings. I like how they turned out. Note the 1943 calendar and the pin up on the wall of the depot. There's also a stove in there connected to the stovepipe. Any WW2-era layout needs military vehicles. 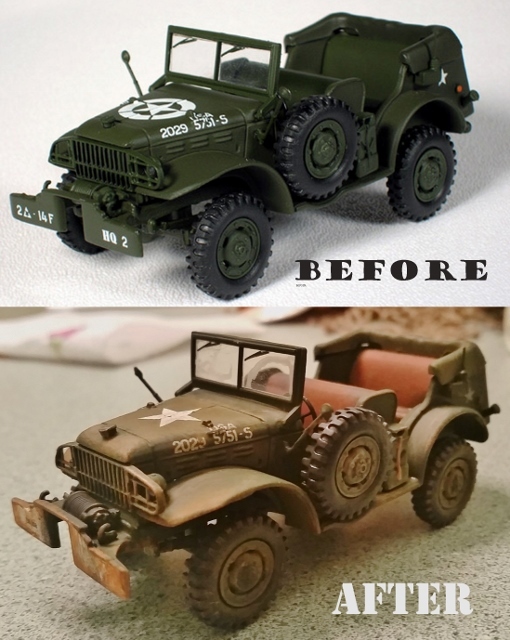 I took some MTH 1/43 scale Jeeps and did some work to them. This shot of them isn't all that good as the flash makes them toy-like looking but it gives you close idea what I did. First, I painted the seat covers the correct color (nobody made tan seat covers for Jeeps in WW2), removed the bumper and (postwar) tire pressure markings. Then, I applied custom-made unit markings, and weathered the heck of them. I was sure to remove the 'invasion' stars on the hoods with the surround, as stateside Jeeps never had those. I also made windshield covers out of napkins and painted them the right color. The command car got weathered a lot more than a real one likely would have been, but I just couldn't resist. These vehicles are all in parked poses. I also have a few civilian cars, with 1943 TN license plates (most have the county code for Carter county, where the layout takes place). 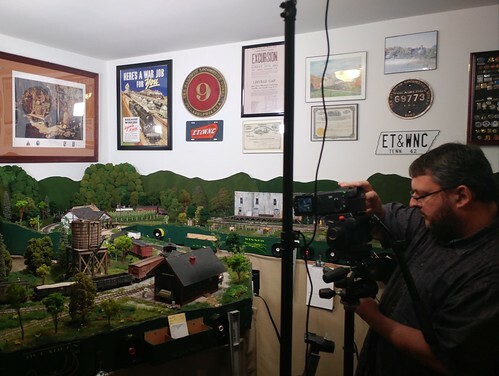 As I am building a layout that takes place in Tennessee in the 1940s, you'd think a moonshine still would be a requirement. The problem there is that at least a few relatives of my parents were moonshiners, but any moonshine still they would have had would have been way up in the woods where nobody could see it until they were standing next to it. My Dad spent a great deal of his youth hunting and trapping up in those hills and he confirmed that he never once stumbled across a still that was being used at the time or had been used recently. Mom told me she once saw parts of a busted up still when she was a kid but never anything else like it. There's also the issue on moonshining during WW2. You'd need a lot of rationed supplies to make moonshine and with many of the young men off fighting the war, I strongly suspect that moonshining wasn't that big a thing in that place and time. 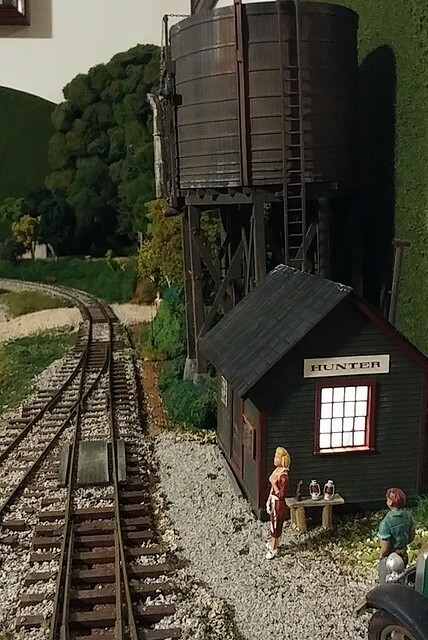 I'm actually disappointed that putting a moonshine still out where a visitor to the layout could see it would be so incorrect as I was looking forward to building one. Minimum mainline curve radius: 22" in two spots, mostly 24"
The locals didn't seem to call the ET&WNC by the name, "Tweetsie" very often back when the narrow gauge was still running. A common way some locals referred to the line was a joking abbreviation for the acronym, "Eat Taters & Wear No Clothes." Some called it, "The Stemwinder". Most of the locals usually just called it, "The Nar' gauge" or simply, "The ET". 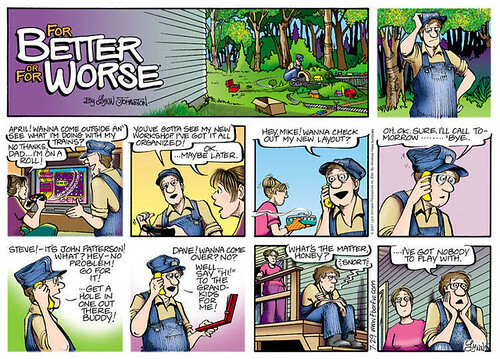 Tweetsie seems to have been a 'flatlander tourist' name that stuck. So, where did it come from? Kids going to summer camps describing the shrill whistles on the ten-wheelers? The coach at Appalachian State as the ET&WNC went past during team practice sessions, on its way out of Boone, NC? An odd contortion of the RR's abbreviated name on rolling stock? No matter what some books claim, we'll never know for sure. Frankly, I've never been a big fan of the name, but saying "ET&WNC" is a bit of a mouth full. The railroad was started in 1898 and by 1900, cut East by Northeast from Elizabethton, paralleling old state 91 on the south side of the Watauga River. It crossed the Watauga at the bend in the river just east of the modern Lynn Valley Road bridge. Paralleling the current highway 91, it ran up into the hills where logging traffic kept the railroad going into the depression era. The railroad got as far as Dry Branch where locomotives were turned around and log cars were loaded. Originally chartered as the Stoney Creek RR, the line added 'Southern' to the end of the name to avoid confusion with state tax collectors over a competing logging line which ran mostly on the south side of the creek. 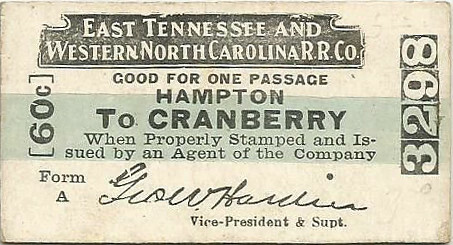 There were various station stops once the railroad crossed the Watauga River, notably at stops such as Hunter, Winner, Sadie and Buladeen. The line was chartered to go as far as Shady Valley, but never got that far. From the bridge crossing and interchange to the end of the line, the railroad was just a little bit over 12 miles in length. Turntables were put in at each end of the line to turn around the 4-4-0s and logging engines seen on the line after a bad grade crossing accident when a locomotive was facing the opposite direction of travel. 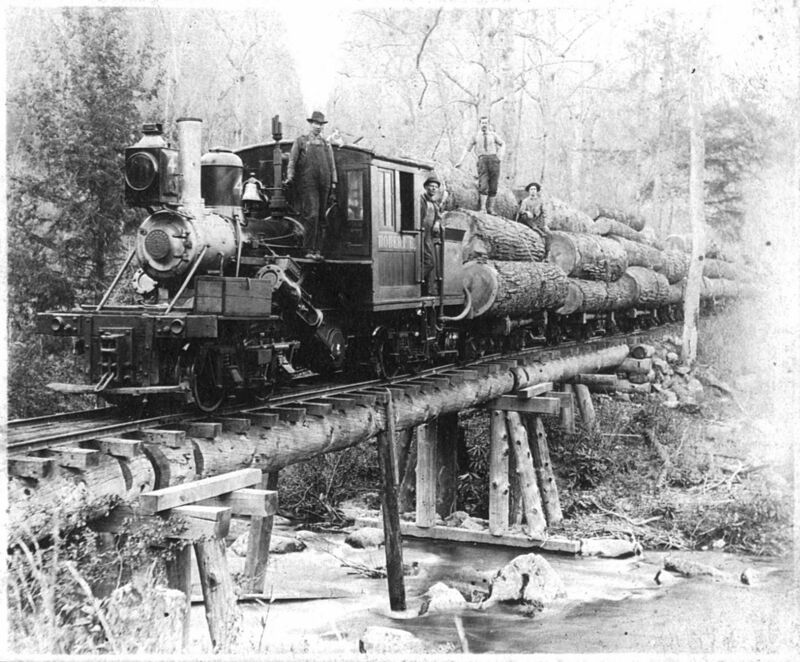 The line saw very little passenger traffic but the logging provided revenue until the 1930s. By 1936, trains were running only once a day, if that. 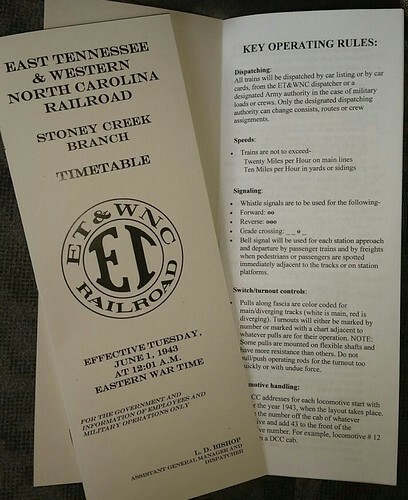 Drowning in red ink, the Stoney Creek Southern offered a buyout of stock to the parent company of the East Tennessee & Western North Carolina RR. By the fall of that year, SCS-marked rolling stock started to vanish and ET&WNC equipment started running up the valley. Although a separate corporate entity into the WW2 years, the SCS was in effect another branch of the 'Tweetsie'. The third storm of the 1940 hurricane season (they weren't named at this time) caused much flooding in the region and washed out the SCS's Howe truss bridge across the Watauga. The ET&WNC filed for abandonment soon afterward, citing declining traffic and the cost of rebuilding the bridge. The ICC ruled against the ET&WNC once they reviewed the current condition of the rest of the line. The Watauga River bridge was the primary damage to the line, which saw surprisingly little damage from flooding along Stoney Creek as the line was built well above the level of the creek in most spots. Only a short section near the Speedwell was washed out and a review of revenues showed a lack of interest in running mixed trains as opposed to a lack of customers, most notably the logging loadout near the end of track and the large barrel component factory midway along the line. Several sections of rail were brought out of Boone when the Linville River Railway was abandoned. The ICC strongly pushed for use of the roadbed of the recently-abandoned Virginia and Southwestern RR (later owned by the Southern Railway) where it crossed the river. 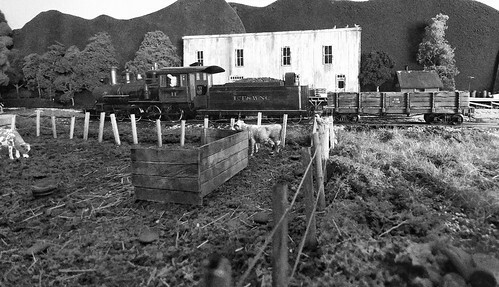 However, the railroad was rebuilt where it was. This remains the only known case of a standard-gauge railroad being abandoned in favor of a narrow-gauge common carrier in American history. 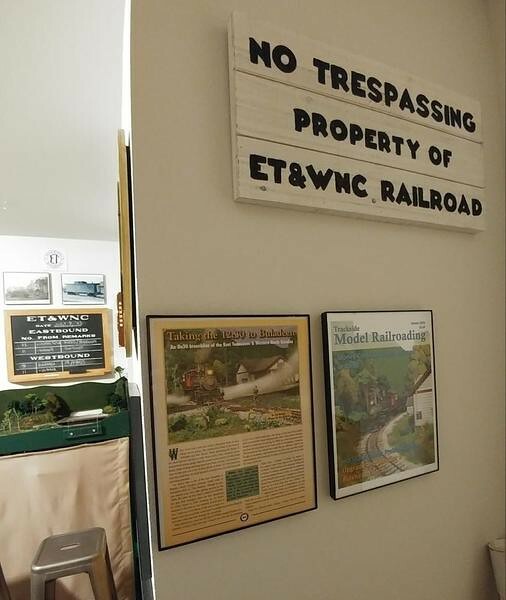 ET&WNC crews would often point out the remaining abandoned SRR trackage and joke with traveling soldiers and newcomers to the valley that, "we even outlasted the big railroads!" Still, the line continued to struggle from lack of operational interest by parent ET&WNC. Pearl Harbor changed all that. By late 1941, the Army had already considered placing an infantry training camp somewhere in the Shady Valley area, but the lack of good roads prevented this. By the spring of 1942, the Army placed a Railway Operating Battalion into the valley with the specific mission to rebuild the aging SCS mainline (by now referred to the Stoney Creek branch of the ET&WNC). This was for the shared purpose of training Army forces in rebuilding damaged railroads for the future liberation of Axis-held nations and also to provide a good transportation hub into the valley for a projected training camp for the Army ground forces. 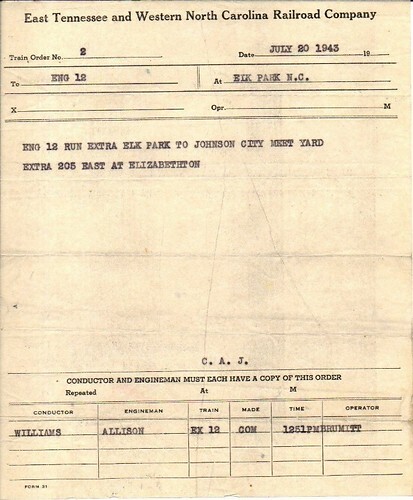 New 55-pound rail was laid and new ballast brought in for the main line before the Summer of 1942. ET&WNC locomotive # 14, originally designated to go to the White Pass and Yukon RR in Alaska along with # 10, was instead headed into the Valley near its home rails instead for Army use. Many soldier-railroaders who cut their teeth on the ET&WNCs ten-wheelers went on to run trains on the White Pass & Yukon in Alaska as well as meter-gauge rail lines in Africa, Europe and Asia. The turntables were still being used but were no longer as useful as the shorter locomotives they were made for were no longer around. Turning a 4-6-0 on either of them was a balancing act with only an inch or two to spare on each end that none of the crews enjoyed doing. By the spring of 1943, the SCS had been rebuilt into a line the locals could be proud of. The tracks were still weed-covered in the summer months and the sidings weren't exactly to any Class I railroad standard, but the track was in better condition than it had ever been. 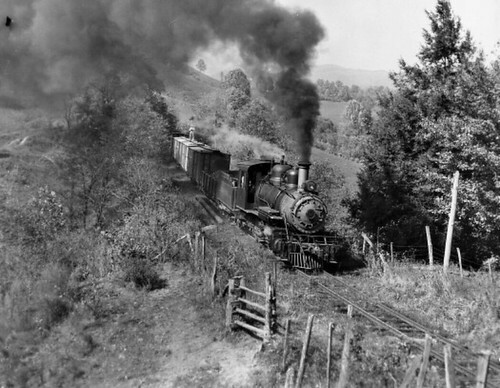 Commuter trains heading for the rayon mills in Elizabethton provided hundreds of skilled workers for needed defense work. Soldiers used the Stoney Creek branch to transport various loads of weapons, munitions, vehicles and supplies. The 3-foot line into the valley had never seen such traffic before, especially now that gas rationing had rendered civilian motor traffic all but useless without available gasoline. It is now late summer in 1943. The line hauls mixed freight, cord wood, military traffic and passenger trains for the mills almost round-the-clock. The Army is also using the line for defense purposes. Soldiers are often seen coming in and out of the valley, further contributing to the local wartime economy. It is the high-water-mark for the three-footers along Stoney Creek. So, why model this railroad? Yes, why model a fictional branch line of a long-extinct railroad that even most train fans don't know today, and from more than 2700 miles from the nearest section of that railroad's right-of-way? The short answer is simple; my parents grew up in the area the ET&WNC ran. 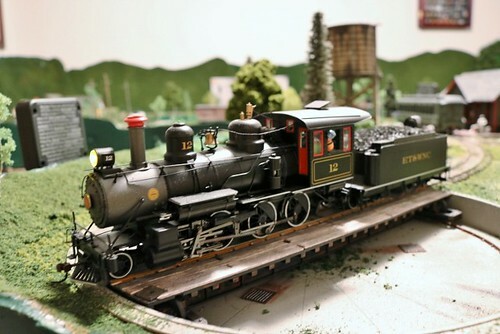 While neither recall seeing the 3-footer trains running (Mom and Dad were both 14 when that portion of the line folded), they both recall the standard gauge trains running into the 1960s. Almost everyone I was ever related to lived in the area; most still do. Our family went to Elizabethton, TN, usually once a year. Every now and then, I might see some remnants of the old railroad. We'd pass the site of the covered deck bridge near Hampton (though I never realized at the time I was always looking on the opposite side of the highway on those trips to see if I could catch a glimpse of the remains of the grade at that point) or if I was really lucky, we'd go to Tweetsie RR near Boone. 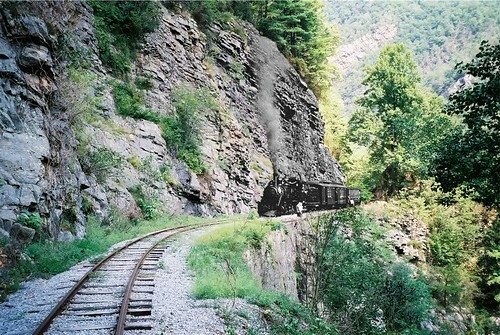 In the early 80s, all the men from the family once went to see the remnants of the grade through the Doe River Gorge. I don't think any of us at the time realized that they'd only stopped running trains through there a few years before as part of the ill-fated, "Hillbilly World," the billboard for which was visible from the highway for many years. The local library up there had a copy of the book, "Tweetsie Country," which I drooled over and got a copy of my own as soon as I could afford one. 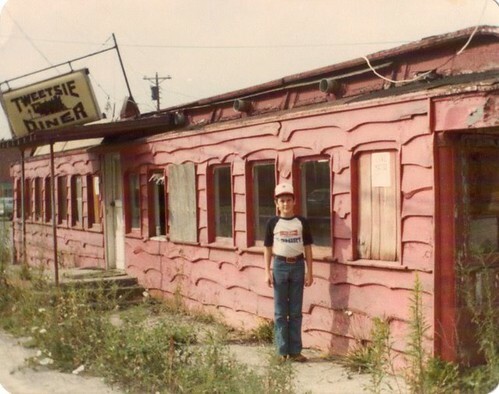 This is me, circa 1982, at the Tweetsie Diner near Newland, NC. This used to be ET&WNC coach # 23. Sadly, it burned down later. 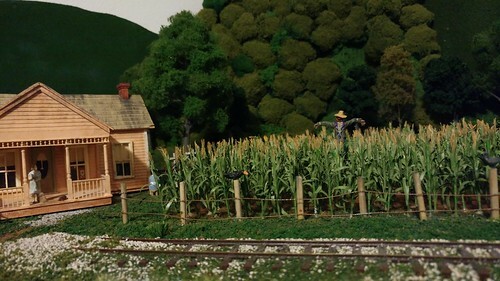 Even though it was gone from the ET&WNC by the WW2 era, I had to include a model representing this coach on my layout. 23 years later, here I am with ET&WNC # 12, a locomotive I've probably seen about 4-5 times in my life. It's also the only locomotive left from the 3-footer portion of the railroad (though standard gauge engines # 207 and 208 both still exist today). On my first trip to the restored Doe River Gorge track in 2000, I overlaid this shot of a train coming around the same curve, taken from exactly the same spot (the edge of the hillside is from the original photo, proving I was exactly at the same location for my photo). And here is an original ticket from the RR! Just in case anyone is curious, yes, I do like 3-footers in other parts of the country. 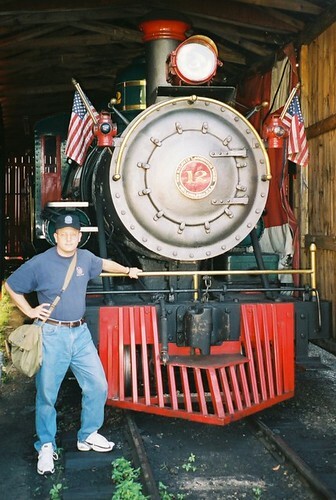 In fact, I've personally been to almost every existing narrow-gauge railroad in the US (including Hawaii and Alaska). 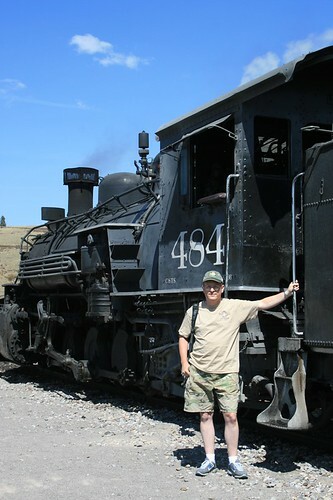 Here I am below at Osier, Colorado on the Cumbres and Toltec... All that said, very little attention has ever been given to 3-footers East of the Rockies, it seems (other than the East Broad Top). The D&RGW lines have been modeled to death and there's nothing I add to that. Okay, you want some links? Here ya go! I badly wish I knew exactly where this was taken.